Full featured yet affordable. If wear resistance and puncture protection are among your top priorities, look no further than the Continental SuperSport Plus. With a tread pattern derived from the race proven Grand Prix, the SuperSport provides reliable traction and excellent handling -- rain or shine. A thicker rubber compound and PLUS protection strip keep sharp objects out, making it well suited for the urban rider or touring cyclist. All Black. Wire bead. Available in 27" X 1 1/8" (116 max psi) and 27" X 1-1/4" (102 max psi). (630 ISO). A totally reliable tire that give me peace of mind since I don't have to worry about flats. I purchased two Conti SuperSport Plus tires to replace some old Continentals on my '90's Schwinn Voyageur in order to have fresh tires for a 200K brevet. They went on the wheels fine and have performed well without flats. I find this a totally reliable brand. Since I cycle to work and cannot afford flats, these give me good peace of mind - which is so much more important to me than shaving seconds off with lighter tires. Wider than expected and handles Brooklyn's streets really well. I was looking for something similar to a racing tire because I like high tire pressures and high rolling efficiencies. There are not a lot of tires out there for a 27 wheel. This tire suits the bill but is bigger and wider than what I expected. Also, it is very stiff and flat and hard to get onto the rim. At first, I followed the recommended procedure of slightly inflating the tube and could not seem to avoid trapping the tube in between the bead of the tire and the rim because of the stiffness of the tire. I blew both front and back tubes on the first attempt. Then I installed the tubes without inflating them and it worked perfectly. I suggest that you do the same. The selection of 27 tires is very limited. I appreciate Continental making these available. I ride a 1989 Raleigh Technium about 100 to 150 miles a week, and have put approximately 1,000 miles on these tires. They were easy to install with the correct tools. I found them to roll easily and handle well. I have had no punctures or failures of any kind. 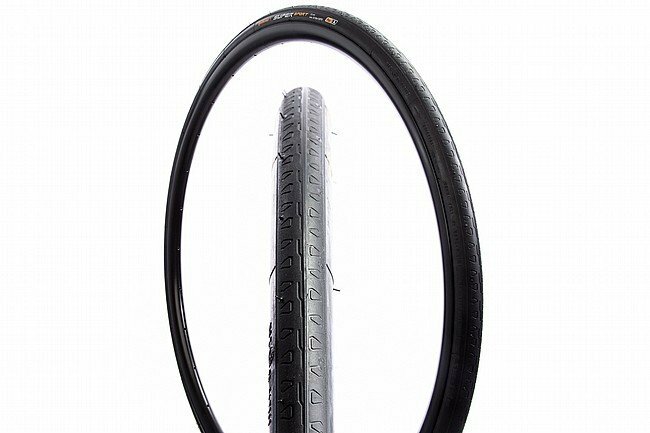 These will be my go to tire on my regular bike that receives a lot of urban riding. I have had these tires in the past and they are the best I have every had. I managed over 5000 miles on them with minimal flats throughout that period. I totally recommend these tire. Seems good for the price. New to riding road bikes, only 1 year in. This was my first tire purchase, put around 700 miles in on them, and they are still going strong. One small issue is that there is cracking on the side walls of both tires, but performance does not seem to be affected. Looking at different tires for my next set to see how they go. If you are looking for a high quality tire for your road bike and don't want to break the budget - look no further. This tire has it all - looks, fantastic fit and durability! Bought another one of these to replace the ultra sport. Worth the extra money in my opinon. I also installed tufy liners and the thorn proof tubes and it all fit fine and easily on my rims. Riding 10 to 15 miles a day on asphalt and I have a 500ft gravel driveway and no problems so far. I am impressed with the design! I am very happy with these road tires, but the thing is these road tires are advertised with a maximum inflation of 102 psi, but the sidewall indicates a maximum inflation of 116 psi. To be honest, these are difficult to mount onto the rims of my mid 1980s Takara Sport 10 and I already broke two tire levers and punctured one tube while I was attempting to mount the first tire. I am quite sure I will be satisfied with this product by the time this WNY weather starts getting warmer. I have put about 100 miles on these tires so far. So far, they are holding up to their description. Have run over some pieces of glass and been ride. They are pretty difficult to put on the wheels. Rides well, looks like quality is on par with other Continental tires. I only have about 50 miles on tire so far. Very easy to mount on rim. These are excellent tires for serious cyclists. I've been riding these tires for a while now and I've never had any problems with them. I ride regularly and do 20 mile rides often. I've never had a puncture. These tires are durable. I use these tires for commuting to work and back. They have held up well. Very smooth and solid ride. Tire is very tough and ,thus, a heavy tire. I can tell you this much though, you will never have another flat tire again. If you ride more than 40 miles you will really start to feel the weight factor of these tires. Can't really find too many great tires in this size anymore. I like this tire.